State Geologist and Director Rick Allis retired in January after 18 years of service with the UGS. 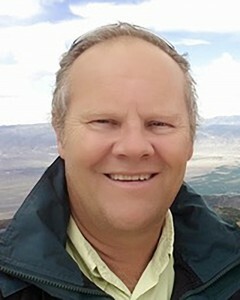 Prior to joining the UGS, Rick was in senior management at the Institute of Geological and Nuclear Sciences in New Zealand, originally known as the New Zealand Geological Survey, and then was a research professor with the Energy and Geoscience Institute at the University of Utah for almost three years. While at the UGS, his steady leadership and strategic vision helped the agency meet a number of challenges over the past two decades. Rick’s emphasis on making all UGS publications available for free on the UGS website, as well as providing geologic information interactively through web applications, led to the creation of the Web Services Section. Anticipating the continuing need for understanding the interactions between geology and water resources, Rick encouraged and supported expansion of groundwater characterization studies and creation of the UGS Wetlands Section. 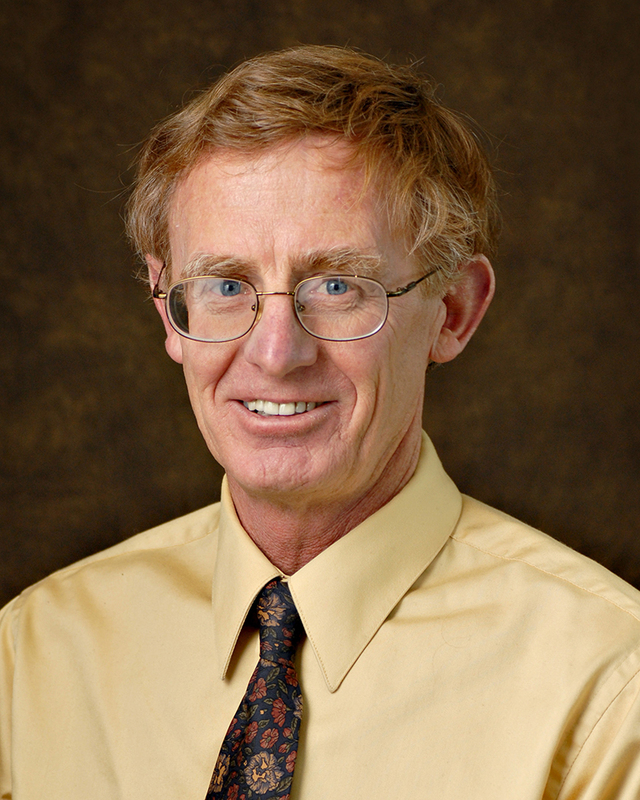 A strong proponent of renewable energy, Rick played a key role in helping Utah be selected as the national Frontier Observatory for Research in Geothermal Energy (FORGE) field laboratory. After Mineral Lease revenues to the UGS plummeted following the crash in oil and gas prices that began in late 2014, Rick’s convincing arguments to the Utah Legislature’s Natural Resources Appropriations Subcommittee concerning the value of the UGS to Utah’s citizens resulted in the 2016 Legislature approving a $1 million ongoing increase in General Funds to the UGS, substantially stabilizing the agency’s budget. As the UGS’s longest-serving director, Rick has left an indelible mark on the Utah Geological Survey, and the agency and the citizens of Utah are the better off for it. Thank you, Rick, and we wish you well in your retirement! Bill Keach has accepted the position as State Geologist and Director and will join the UGS in mid-January. Bill is a scientist, educator, and expert in technology with over 30 years of experience in industry, academia, and regulatory state government. After earning a B.S. degree in Geology from Brigham Young University and an M.S. degree in Geophysics from Cornell, Bill spent over five years in offshore hydrocarbon exploration in the Gulf of Mexico and with SOHIO/BP in California. He then joined Landmark Graphics (now Halliburton) where he spent 17 years traveling the world developing 3D visualization technology and adoption. He returned to Utah in 2006 taking roles at both the Energy and Geoscience Institute at the University of Utah and Brigham Young University doing research and teaching courses on seismic interpretation and reservoir modeling. One of his favorite roles in academia has been the opportunity to develop and lead field courses taking students and professionals from around the world throughout Utah to see and learn its many wonders. In 2017 he accepted a role with California’s Division of Oil, Gas, and Geothermal Resources to evaluate reservoirs and bring technology into the division. The latter goal was recently realized with the introduction (first ever) of computer interpretation tools. Another goal was bringing in UAS (drone) technology and developing protocols for regulatory inspections. While in California he has continued his adjunct appointments with the University of Utah and Brigham Young University to satisfy his passion for teaching. We welcome Bill and look forward to working with him at the UGS. The conference and short course will be held at the Utah Department of Natural Resources Auditorium at 1594 West North Temple in Salt Lake City, Utah. The conference will be open to the geologic community. 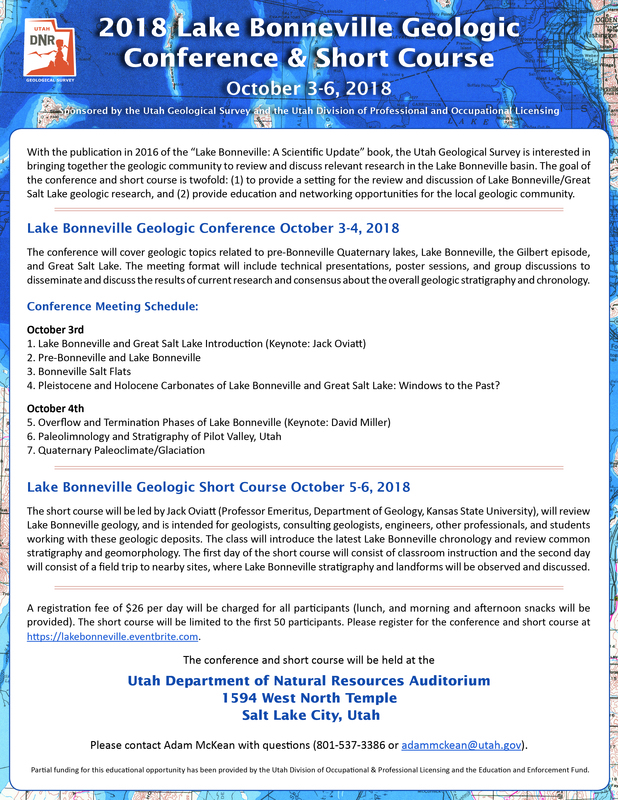 The conference will cover geologic topic related to pre-Bonneville Quaternary lakes, Lake Bonneville, the Gilbert episode, and Great Salt Lake. The short course will be led by Jack Oviatt and will review Lake Bonneville geology. The first day of the short course will consist of classroom instruction and the second day will consist of a field trip to nearby sites where Bonneville stratigraphy and landforms will be observed. These meetings are sponsored by the Utah Geological Survey and the Utah Division of Professional and Occupational Licensing. The conference format will include technical presentations, a poster session, and group discussions. If you are interested in presenting at the conference, please contact Adam McKean for further information. Registration for the meeting will hopefully open by the end of July. A separate formal announcement will be sent out with an online registration link on that day. A registration fee of $26 per day will be charged all participants (lunch, morning and afternoon snacks, and short course booklet will be provided). Partial funding for this educational opportunity has been provided by the Utah Division of Occupational & Professional Licensing and the Education and Enforcement Fund. https://geology.utah.gov/wp-content/uploads/ugs-logo-large.png 0 0 Utah Geological Survey https://geology.utah.gov/wp-content/uploads/ugs-logo-large.png Utah Geological Survey2018-07-02 10:02:052018-07-02 10:02:05Save the date! According to the Arizona Department of Transportation, approximately 23,000 vehicles travel through the impressive scenery of the Virgin River Gorge on Interstate 15 daily. Located in the northwestern corner of Arizona, the Virgin River Gorge can be considered with a modest dose of imagination to be a geological example of the rabbit hole in “Alice in Wonderland.” With even a passing interest, it becomes evident that there are major changes in the geography and geology from one end to the other. These changes are due to the fact that hiding in plain sight within the gorge is a major geologic province boundary. This boundary separates the Colorado Plateau Province on the east from the Basin and Range Province on the west (Figure 1). Significant differences geographic and geologic features are a result of differences in the geologic history and the geologic processes that are operating below the surface of these two provinces. Exposed rocks visible in the gorge, however, provide “forensic” evidence for what is happening. RIVERDALE — A new aerial video helps show the extent of the Spring Creek Road Landslide, which has prompted evacuations and continues to grow as spring runoff increases.